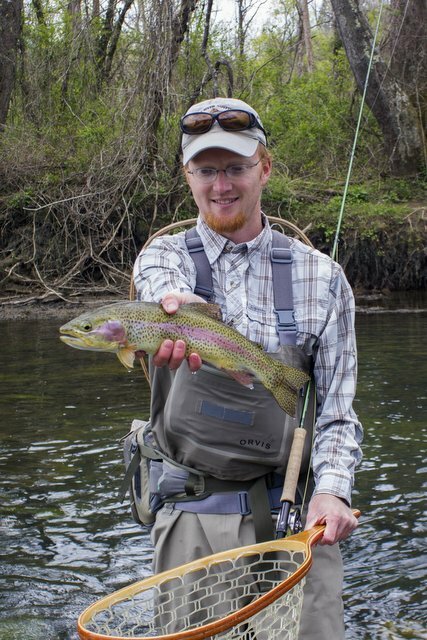 The Clinch River continues to fish well and produce quality trout. 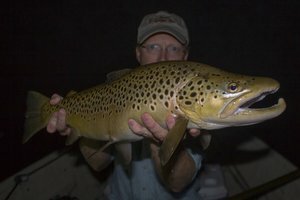 This fishing is not for everyone as it requires the ability to cast fairly well and manage your line, however those who are willing to work hard on this beautiful tailwaters will be rewarded with some large trout. Recently, I had the good fortune to float the Clinch with Chris and Eddie and already know this will be a river I'll return to many times. Small flies, light tippet, large trout, it doesn't get any better. The majority of fish were caught on my own midge patterns although some nymphs worked as well. Both guys caught some really nice trout but Eddie took top honors for big fish of the day. He played it well and kept his composure through several head shaking runs by the nice rainbow. Here are a few fish from out day on the water. This might be the year of the Clinch River, or at least for me anyway. I've now fished it twice within the last four days and that after not fishing it since, well, I can't exactly remember the last time I was down there but it has been a while. Based on the fishing last Friday I'll be down there a lot more. Based on the fishing today it might be a while before I'm back. Let me explain a little further. Last week, with the nice weather, I've been contemplating fishing a little for myself. With the spring hatches in the Smokies has come a flurry of guide work. That is all well and good, but I do like to at least occasionally fish a little for myself as well. 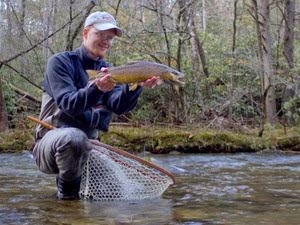 After a steady dose of the beautiful but small wild trout that are found in the Great Smoky Mountains, I was ready for some fish that were larger and more difficult. The Clinch offers both in great abundance. The idea had been bouncing around in my brain for a while when my old fishing buddy, Trevor, checked in to see if I was available to fish on Friday. Amazingly enough I actually had a free day. Plans were originally made to fish the Caney Fork, but a last minute change of plans had us headed to the Clinch. When we arrived at the usual Millers Island access, I was shocked to only find a couple of other cars in the parking lot. This place gets packed so to say the lack of people was a blessing is an understatement. We started with the usual midge rig that is so effective on this river. I quickly caught a little rainbow and later another. Trevor got into a hot streak in a good spot. Eventually I snuck in close enough to snag a fish or two myself out of his run when he got tangled momentarily and couldn't fish. For the most part it was slow. 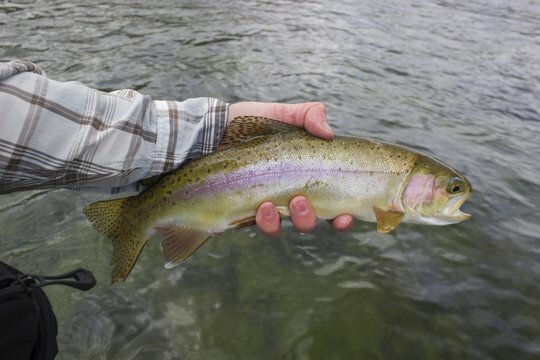 The one high point of the morning was when Trevor got a solid 16-17" rainbow that was all colored up. Some of the fish spawn this time of year so their colors are usually extra vibrant. The real event had yet to happen for me though. We moved well down the river to a spot near the town of Clinton. Having never fished there, I trusted Trevor's directions and judgement which included a lengthy walk. As we were walking along the river, the occasional rise would prompt me to ask if we should start fishing, but he kept telling me to keep going. Finally, just when I thought we had embarked upon a true death march, he announced that we had arrived at our destination. I looked around and almost immediately noticed a rise downstream just a few yards. Bugs were in the air including caddis and craneflies which prompted me to switch to the tried and true dry/dropper rig with a caddis pupa as the dropper. In reality, this was my favorite Smoky Mountain rig, something that should never work on the educated trout of the Clinch. On the other hand, sometimes you just never know. 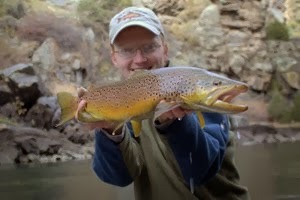 On probably my second or third cast with the new setup, the dry fly shot under, and I was hooked up with a solid fish. 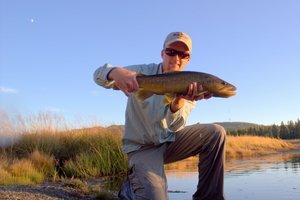 This fish was strong and acrobatic, giving my four weight fly rod a better workout than it has seen in quite some time. Trevor soon had his net out with an offer of assistance which I gladly accepted. Soon I was admiring a great Clinch River rainbow trout, the first of many more to come. In fact, I continued to catch trout up and down that section of river, working my way across towards the far bank and back. While I know that I shouldn't expect the same from the Clinch every time I fish there, it was enough to tempt me back for several more times in the near future even if some of them turn out to be far less exciting in terms of fish catching. In fact, I say that after a very slow day on the water. Today's plans were made just a couple of days ago. The forecast had been calling for partly cloudy skies although a chance for some wind was cause for mild concern. When I arrived to meet my friend John who had kindly offered to show me some of his favorite water, things were looking good. The river had a little bit of chop but nothing too intense. We were soon rigged up and ready to fish with small dark nymphs and midges, in other words, traditional Clinch fare. After slowly getting in the water to fish, I proceeded to cast and mend, and mend, and cast again. Over and over, but without that nice motivation of a diving indicator and heavy trout on the other end of the line. 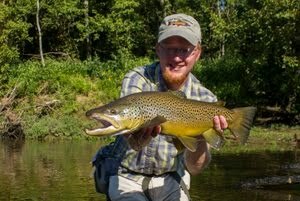 Finally, one suicidal trout nailed the nymph which broke the monotony, but otherwise the day was slow. John eventually ended up with a fish as well, but we more or less agreed that the fish were not feeding. The weather was rapidly deteriorating and we both like to think that played a significant role in the lack of fish to hand. The wind was soon approaching gale force and when the rain started like stinging needles, we waded out and trooped back to the vehicle. Despite the lack of large numbers of fish, the company was good, and I kind of like having challenging days because it keeps me interested. 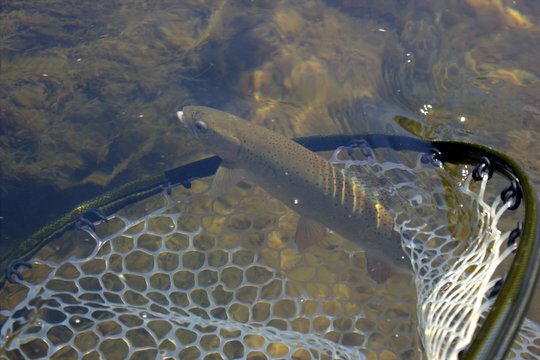 Problem solving is good for the mind and is one of my favorite parts about fly fishing. I guess that's the math teacher in me. The Clinch River promises many more days of both large trout and good problem solving opportunities so I'll be back again and again over the next few weeks. 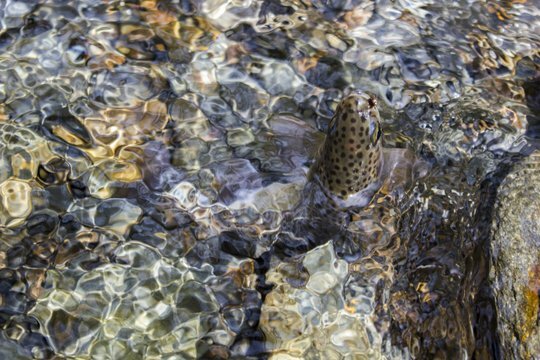 As you probably already know just from a quick glance at the Trout Zone, I enjoy photography almost as much as I enjoy fly fishing which happens to be quite a lot. Finding that perfect shot where light and subject combine to create magic is nearly as fun as catching a nice trout. Sometimes, though, the two combine. That is what happened the other day and I didn't even know what I had until I got home and looked at the pictures on my computer. Most pictures end up not quite as good as you remember the scene in real life. This time, however, I was definitely pleased with the result. When I snapped this picture I was just in the middle of taking several and had no idea what I had captured. I love the mix of light in this picture. The below-water portion of the little rainbow trout blends in so well with the rocks that it is no wonder we have such a difficult time spotting fish in these rocky streams of the Great Smoky Mountains National Park. While I would love to take full credit for the way this picture turned out, sometimes the beauty produced by the camera is largely luck and this image definitely falls into that category. Either way, I'll enjoy remembering the smile on the angler's face during our guided fly fishing trip in the Smokies as he landed this beautiful wild rainbow trout.